With Chinese New Year 2018 (CNY2018) a little more than a week away American multinational technology company Apple has thrown its hat into the Singapore CNY2018 sadvertisement ring with its own take on family togetherness at such a time… and it is awesome! Taking a leaf out of the book of Thailand advertising agencies, where heart-wrenching, gut-churning, tear-inducing sadvertisements are a refined art, the Apple #3Minutes CNY2018 sadvertisement is drawn from a true-life situation, rather than based on generic screenplays and cookie-cutter characters. Focusing on the realities of modern day living and single parent families, Apple’s CNY2018 sadvertisement delivers its message precisely on target, with none of the heavy guilt overtures or stereotyping such as contained in the CNY2018 sadvertisements produced by Singapore’s Singtel or StarHub. More importantly, the importance of the reunion to parent and child are both captured. 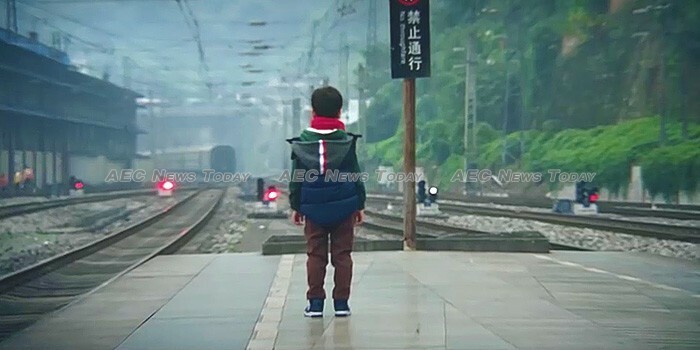 In Apple’s #3Minutes CNY2018 sadvertisement ‘Ding Ding’ has been taken by his aunt to the train station at Kaili, a county-level city in southeastern Guizhou Province, where the train his mother is working on will stop… for just three minutes, before continuing on its six-day journey. One doesn’t need much imagination to picture the hustle, and bustle of travellers anywhere frantically trying to embark and disembark a train travelling through any holiday period, let alone one such as Chinese New Year. As the train rolls to a halt Ding Ding frantically pushes his way through the sea of moving humanity in his desperate attempt to find his mother, distracted only momentarily by a dancing, red-eyed dinosaur (kids will be kids), while all around him joyful reunions are taking place. Meanwhile, his mother is dutifully attending to her duties, while keeping a look out for her son. All the while the seconds are counting down. What transpires when the two reunite is something most parents can relate to. Told that if he couldn’t master his multiplication tables he will be sent to a school far away from home, Ding Ding starts to recite them for his mother. One minute and six seconds after the two have reunited the boarding bells begin to ring and 13 seconds after that CNY2018 for this family is over as Ding Ding’s mother reboards her train… Ding Ding continuing to recite his math tables. The Apple #3Minutes CNY2018 sadvertisement leads out with still images of happy reunions and the message ‘Every minute of a reunion is worth keeping’, before cutting back to Ding Ding and his aunt standing on the platform as his mother’s train slowly departs; thankfully fading to black before the expected image of the pair standing on a deserted train station appears. Unlike the Singapore telcos efforts which failed to give any hints as to how modern day communications services can play a role in family reunions and togetherness, Apple’s #3Minutes sneaks in a message about how people can learn to preserve their Chinese New Year story on it’s trouble-plagued iPhone X with Peter Chan… though it doesn’t say how. Recorded at 4K (4,000 pixel) resolution at 60 frames per second (FPS) on an iPhone X*, the Apple #3Minutes CNY2018 sadvertisement is stunning quality, with the complete production also delivering some picturesque panoramas of Chinese countryside, as well as revealing views of its smog-shrouded cities along the way. Appearing to all visitors to the Apple Singapore website, #3Minutes has racked up more than 1.1 million views in less than four days on the Apple Singapore YouTube channel. Because of the issues touched upon, the inclusiveness, and sensitivity to the vast range of emotions that people feel at such times, we at AEC News Today anoint Apple as winner of the Singapore CNY2018 sadvertisement battle. Pity about the choice of phone though. *Additional cameras and applications were used to film additional scenes accompany #3Minutes.